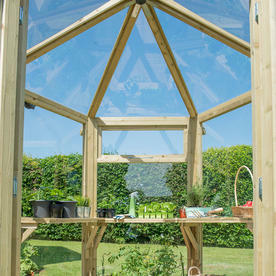 Gorgeous elegant glasshouse for tender plants and seedlings. This elegant hexagonal timber greenhouse combines style with functionality, it features fully glazed panels with three opening top windows. 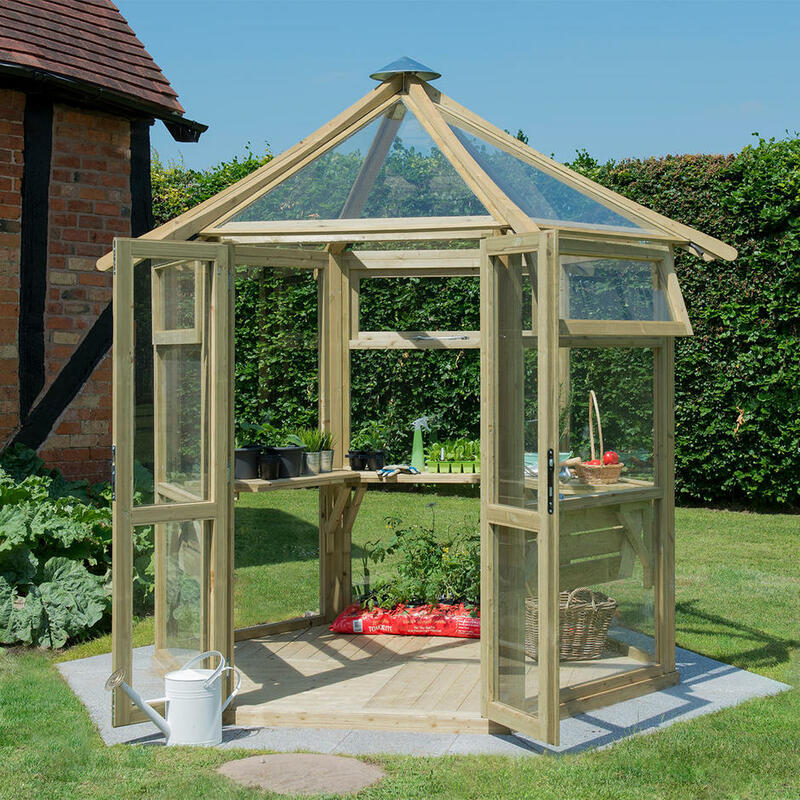 Safety glass is used throughout the greenhouse. 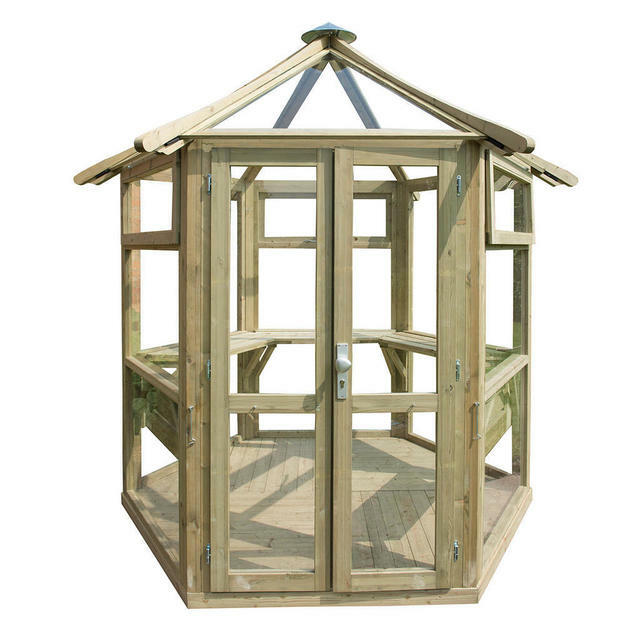 The greenhouse is supplied with five sets of flat packed interior wood shelving and has an integral wooden floor. 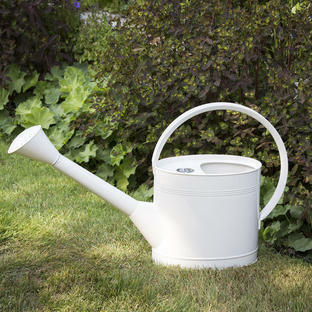 The unique roof venting system prevents the build up of hot air, maintaining a more uniform temperature for growing. This glasshouse has a footprint of 230 x 199cm. 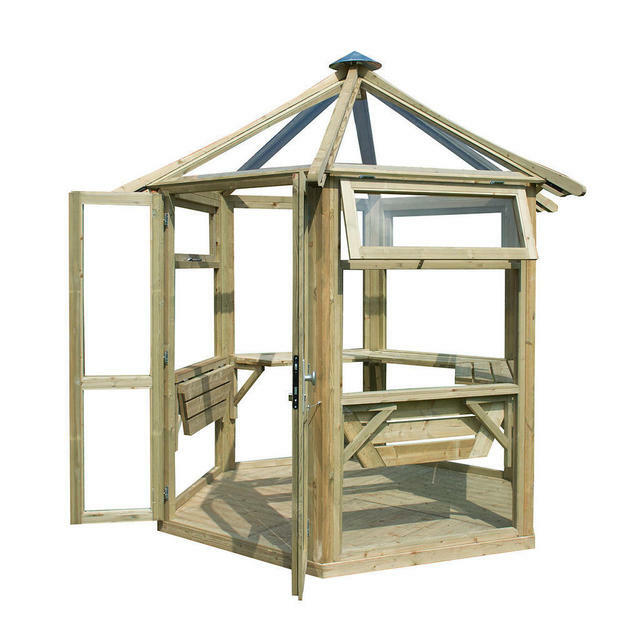 Timber has been planed for a smooth finish and is manufactured from pressure treated softwood. 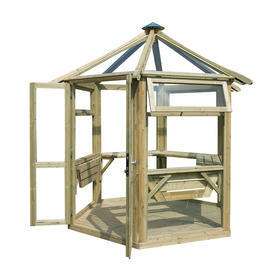 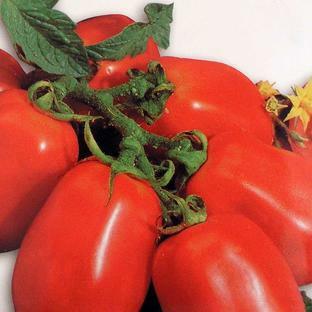 The greenhouse has a 15 year warranty against rot. 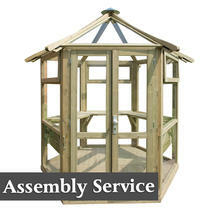 If you are assembling the greenhouse it will take approximately 8 hours to construct. 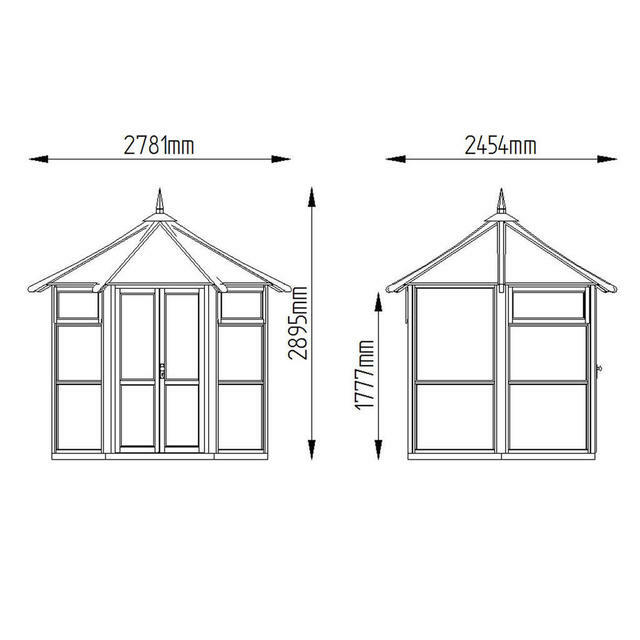 The greenhouse comes complete with fittings and full assembly instructions. 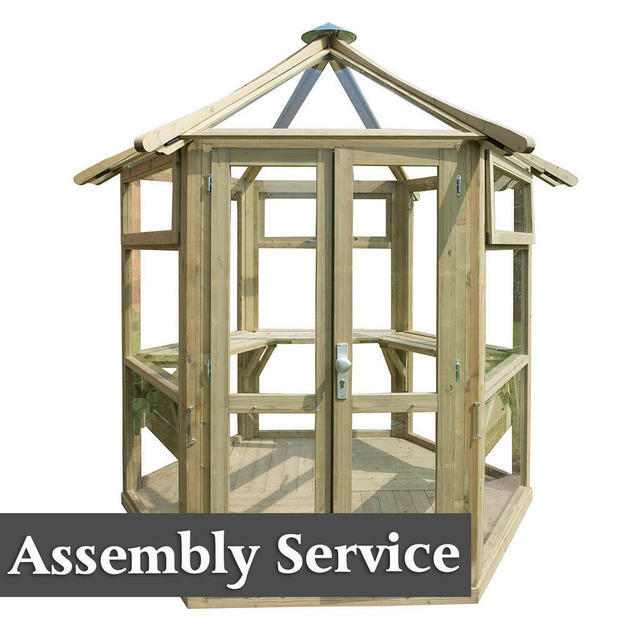 We do offer a separate assembly service, if this is required the ground needs to be flat, solid ground and made ready for assembly. 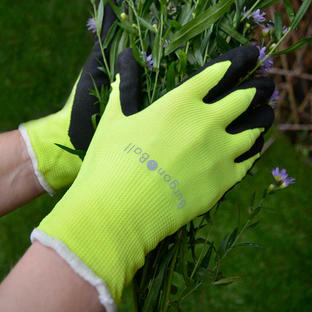 Fitting service is available, installation approx.from 3-4 weeks from order. 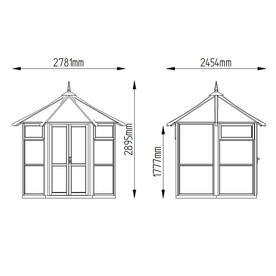 Please note however we are unable to offer delivery of this glasshouse to addresses in the Scottish Highlands and Islands, Northern Ireland, Chanel Isles, Isle of Man, Scilly Isles and Isle of Wight and Europe.